Below is a diagram and brief overview of the components that make up a safe and secure roofing system, protecting your home from the elements. * See GAF Shingle & Accessory Ltd. Warranty for complete coverage and restrictions. The word "Lifetime" means as long as the original individual owner of a single family detached residence (or the second owner in certain circumstances) owns the property where the shingles and accessories are installed. For owners/structures not meeting above criteria, Lifetime coverage is not applicable. 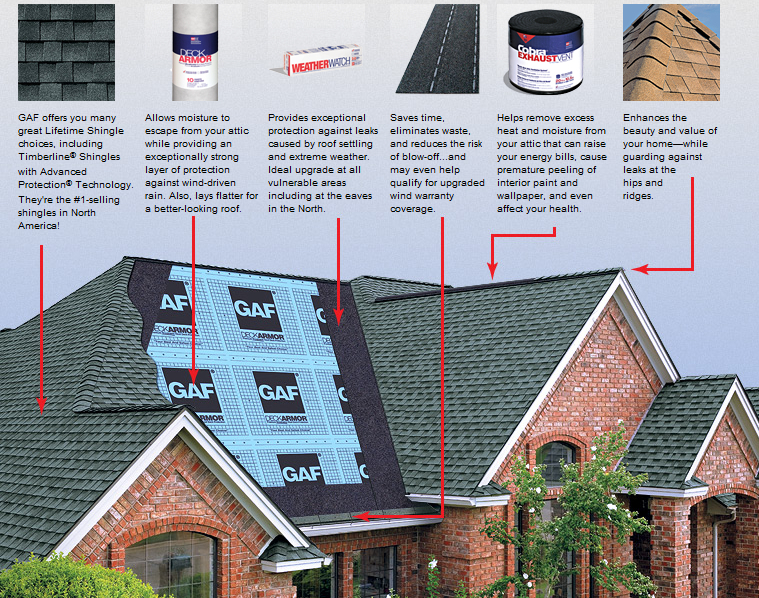 Lifetime ltd. warranty on accessories requires the use of at least three qualifying GAF accessories and the use of Lifetime Shingles. ** On your Lifetime Shingles and qualifying GAF accessories. Prevents wind-driven rain. . . Provides an extra layer of protection. . . Helps reduce blow-off. . . Weather Watch is Ice & Water Shield, it provides exceptional protection against leaks caused by property movement and extreme weather. It also seals nail penetrations. It won't leak, ensures a 100% watertight seal. A leak barrier helps prevent wind-driven rain from leaking through the roof deck, or melting ice and snow (caused by ice dams in harsh winter climates) from leaking into a property’s interior. It adds extra protection in valleys and at eave and rake edges—the most leak-prone areas of the roof. Strongly recommended for chronic problem areas like skylights, dormers, vent pipes, chimneys, and other flashing areas. Choosing the right shingle can increase the value of your home. GAF and ELK have teamed up to offer you many great premium choices, Including Timberline and Prestique High Definition the # 1 selling shingles in North America. The color and style of the shingles you choose will define the look and appeal of your home. Cobra and Master Flow vents help remove heat and moisture from your attic. Poor attic ventilation can ruin your insulation, destroy your shingles, and raise your energy bills! Why Take Risks? It is estimated that 9 out of 10 homes in North America do not have proper attic ventilation. Why? Because most people are unaware that attic ventilation can impact the longevity of their entire home! For example, in the summer, an improperly ventilated attic can cause heat to build in excess of 160°F. This superheated air eventually penetrates the ceiling insulation into the living area below. Skylights are the perfect way to add natural light to family rooms, kitchens, bathrooms, or any room that would benefit from the architectural style and luxury of a skylight! Liberty a self-adhering membrane roofing system will provide long-lasting protection for the low slope areas of your property without the danger or hassles associated with open torches or hot asphalt. Shingle Match accessory paint enhance the beauty of your new or existing roof.